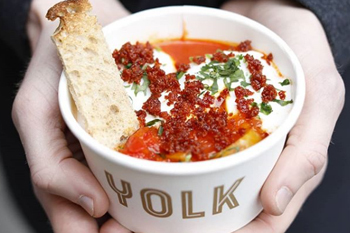 Yolk, kings of the takeaway world transform breakfast staples into exquisite grab-&-go options for busy Londoners. Tucked away in destinations around the City they serve speciality coffee, ultimate sandwiches and perfectly poached Clarence Court egg pots. Available from 7-10.30am customers are treated to a choice of scrumptious pots including the Benedict a pot packed with ham hock, Burford Brown eggs, cayenne and their signature hollandaise, Rancheros featuring smashed avocado, chilli, coriander, lime, tomato and crowned with poached Burford Brown eggs, and the classic Royale served with smoked salmon. Now if you work around Chancery Lane or Fleet Street you can enjoy a golden start to the day everyday as Yolk are set to open a new permanent spot at New Street Square – so there’s no excuse to skip breakfast, arguable the most important (and most delicious) meal of the day. Tucked in just off new Fetter Lane, their new home is going to be mainly a takeaway spot although there will be a few stools inside and a covered seating area to soak up the morning sun when it shines. For a flavour of their menu, head over to their deliciously tempting Instagram feed.